Hello everyone. It's been a really long time to post. My lovely Elza passed away in 2017, no typo. Today would have been her 10 years old birthday. I bought her a birthday cake and pretty flower arrangement in pink. My husband and I are still talking about Elza each and every day. Elza was loved so much and an idol in our neighborhood. People knew how much we were together all the time so they, who had never rang the door, visited me to check how I was doing in the dark holed days. I was saved by many people, thanks to Elza, strange to say though. Elza was just so happy until something went wrong, only half an hour later. She couldn't lay down and whined. We took her to the ER around 2a.m. and found out lots of fluids in her lungs. X-ray shows almost all white. In the morning we transferred Elza to her regular vet and she was hospitalized for three days. She needed concentrated oxygen to breathe easily. I visited her AM and PM everyday. When she felt fine, I walked her outside. The vet and I had a great hope. Actually she was scheduled for release in a few days. On the 4th day morning, I was preparing to visit her by packing the cut apples that were her favorite, and my smartphone rang at 8:20. The vet said Elza had gone when the staff came to the clinic. He also said she must have passed away between midnight and 1a.m. I know she passed away at 12:46a.m. Without any indication, I suddenly woke up and checked the clock. I do believe Elza came to me to say good-bye here on the earth. I couldn't believe Elza passed away and believed one day she would come back to me. My husband and I kept our routine; morning walk holding her beautiful collar, and I walked alone in the afternoon. Very strange to say, I could walk outside alone! When I was asked where's Elza, I talked what happened to her. Walking and talking someone were great relief at that time. However, I hesitated to announce this on FB for weeks. I couldn't stand reading the condolence messages right after that. DT was a special place for me. Elza and I enjoyed a lot for SS and Christmas card exchanges. Some are my good FB friends now. So sorry it took me such a long time. I'm typing this without crying. Yes, I needed enough time. Happy birthday my sweetest girl Elza. I miss you so much. 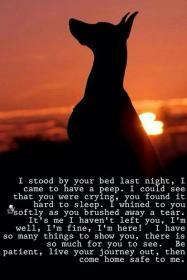 Run freely and meet many many DT Dobermans over the rainbow bridge. No passport necessary. I'm so sorry. Dobes grab ahold of our hearts and stay there. Eventually we can smile with the good memories of the times we had together, but that can be a long time coming. Each and every one is such a very special dog. Sleep softly; run free, Elza. I'm so sorry to read about Elza, and I'm glad you were able to come here and share the experience. It is harrowing and heartbreaking, when they leave us. Real sorry to hear of your loss......but glad to hear your heart is mending. Loss my pup 4 years ago..........similar to you I continued my walks everyday with his lead hanging around my neck.....I still talk to Mafia all the time. He's always with me and so is your pup! I am glad you had the privilege and joy of Elza in your life. Cherish the memories. I am so sorry. I hope another doberman finds you when the time is right. So very sorry - Elza was truly an angle, within the breed. It takes much time to heal, when our heart-dogs...do go to heaven. Rest in peace, Elza. She surely did brighten all our lives with her wonderful experiences told here on DT. We cherished photos of Elza's cute, matching outfits worn with her mom while walking about the neighborhood. Other pictures enjoyed were of Elza attending local festivals, in the shopping cart with her dad at stores and enjoying play dates at the park. And, who could forget Elza's lavish birthday parties fit for a princess? I believe Elza, in her brief life, bestowed much joy upon her own family, strangers and friends whom she met in Japan, as well as us here on the DT forum. If you can, please post some of your favorite Elza pictures in this thread so old and new DT members can view, as a tribute to her. that kind of impression on your friends and neighbors. I am so sorry for your loss. Elza was always a favorite here. Lots of love your way. I am sure you will run into a few of my boys over there. Wag your nub... Say Hi... and they will be your friends. I'm very glad and surprised to hear you remember the pictures and events Elza and I had! Thank you everyone who left the message. I will definitely come back soon!! I'm so sorry to hear about Elza. What a beautiful special girl she was. She will be missed by many of us. I understand your pain. We lost Coco December 21 and it still is heartbreaking. Hugs to you and your husband. so sorry to hear this - sounds like it might have been DCM. RIP Elza, and hugs to you. I missed this until now, goodnight princess Elza, you were very, very loved! As an aside... I just noticed she shares the same birthday as Nadia. I'll be sure to light a candle for Elza too each year from now on. Please accept my most sincerest condolences. I somehow missed this post but you know how sorry I am for your loss. 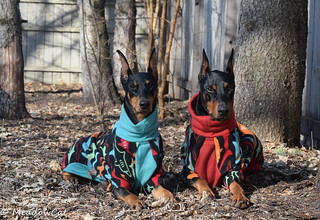 I am new to this site, but please accept my condolences...its amazing how dobermans connect with us on such a deep level.. I'm so sorry to hear about your loss. Sounds like she led a wonderful life and was very much loved. The holes that they leave in our hearts are immense. I hope you can reach the time when her memories will bring smiles instead of tears.